Info "Prove you've got the chops!" 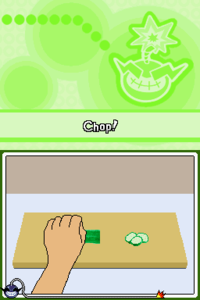 Got the Chops is a microgame found in the Cute Cuts stage in WarioWare: Touched! The objective of the game is to use the stylus to slices and chop the vegatables into bite size while being careful not to slice the hand. This microgame has twice the time to complete. 1st level difficulty: The player must cut a few times. 2nd level difficulty: The player must cut many times. 3rd level difficulty: The player must cut even more times. This page was last edited on October 1, 2018, at 11:28.